On a last day of June the best (and at times) the worst distraction came into my life. 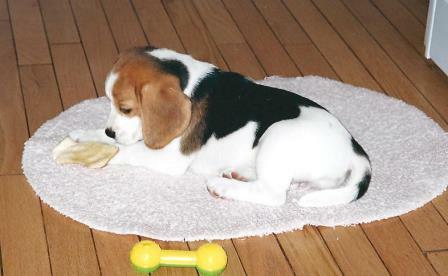 She weighed six pounds at eight weeks old, sporting long, tan floppy ears. Her black, tan and white body supported by four white stocky legs stood at attention as she let loose a howl rendering eardrums buzzing with a piercing pitch. She ran the perimeters of every room and then, heeding the call of nature, stopped suddenly, sniffed diligently, squatted and peed. Suddenly, her jump start in running at top speed around the fenced-in yard reminded us of . . . lightning; hence Tooker’s Girl Lightening became her AKC name. You could find Dottie, my beagle pup, occupying the laundry room and kitchen for the first few weeks, not because she was naughty already but because it was a requirement, a strategic move on my part. Bare floors were essential. The slippery ceramic tile and old wood teased her under foot with maximum escape potential to destinations unknown: rooms beyond. Dottie stole my total concentration and ability to get “in the moment.” As a writer, my at-home occupation, my writing time was condensed and put on a time clock. Ready. Set. Go. Dottie had been lured into her crate in the hopes of a long afternoon siesta. Before Dottie’s arrival my days were planned, balancing writing time with reading the stack of books lined up like toy soldiers ready for battle. But I learned from my highly motivated scent specialist that planning my days got me nowhere but just expended energy. That was twelve years ago and Dottie, with barking capped by her trademark howl, has become more selective in targeting her opponents. Her stubbornness shows when she digs her back legs in deep and stops hard in her tracks to determine the route she will take her walk, clearly driven by scent. But in the house, we have learned to cooperate. She has become a willing participant with some degree of predictable behavior to nap in her crate for periods longer than twenty minutes, allowing me to rush to my writing post and commence where I left off, not days ago, but just an hour ago. I find that my thoughts are more complete, my essays expanding with new paragraphs thanks to Dottie’s ability to fall into my schedule. I’m back to being a planner with the help of Dottie.